FME Show #9 Listen to the top-notch mixing, recording, and/or production skills of Julie Kathryn (a.k.a. I Am Snow Angel), Emily Bowie, Jojo Worthington, and Darcy Jeavons. Also, an update on the free Loudness Penalty Analyzer tool by MeterPlugs (which tells you if your track will have its volume decreased before playback on Spotify, Pandora, YouTube, and more) — and a link to a FREE plugin license for a cool plugin of your choice from Black Rooster Audio. FME Show #8 Kick back and soak in the fantastic mixing, recording, and production skills of Anna Wang, Kat Ward (Boxtape), Lisa Conway, and Katie Marie. Also, I have an idea on how to inspire more girls to get involved with audio engineering, but it needs to be a group effort! And there is a new, FREE tool to test the loudness of your track — and tell you if online steaming services are going to have to turn the volume down before playback…that is vital information when mastering! FME Show#5 Come listen to the exceptional mixing, recording, and production skills of Halie Loren, Silversnake Michelle, Jillian LaDage, and Melody Monroe. Also, the “dirty” little secrets of how distortion can actually fix your not-so-perfect recordings! Woohoo! Let’s get mixing! FME Show #4 This episode spotlights the outstanding mixing, recording, and production talents of Whittney Mikkél, Amber Snider, Emily Spiller, and Lucy Skystone. Also, let’s chat about the controversial subject of vocal tuning, and learn the one word to help you use your pitch-correction plugin successfully Let’s get mixing! FME Show #3 This episode will knock your socks off with the mixing, recording, and production talents of Becky Willard, Drea Drury, Shelsey Jarvis, and WEEP. Also, let’s chat about one way to get to know your DAW well: by exploring its dropdown menus! Oooooo, what does this button do? Let’s get mixing! 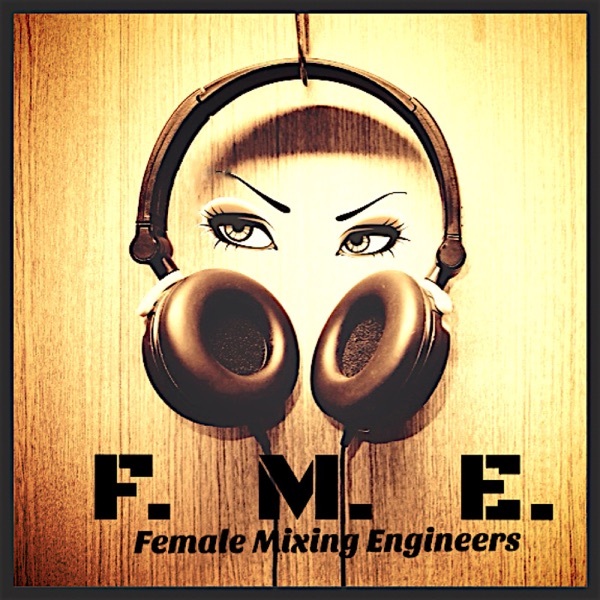 FME Show #2 This episode we welcome the mixing, recording, and production talents of Aubrey Whitfield, Mikalyn Hay, Cj Law, and Vanessa Silberman. Also, let’s chat about why it’s important to make sure your mixes travel well, and understand what a “noise floor” is. Let’s get mixing! FME Show #1 Join our premier episode with the mixing, recording, and production talents of Katie Marie, Jordan Reyne, Michelle Lockey, and Kiera Osment. Also, let’s chat about being a female in the audio world — and learn together that recording, editing, mixing, producing, and mastering can cross the great gender divide. Let’s get mixing!